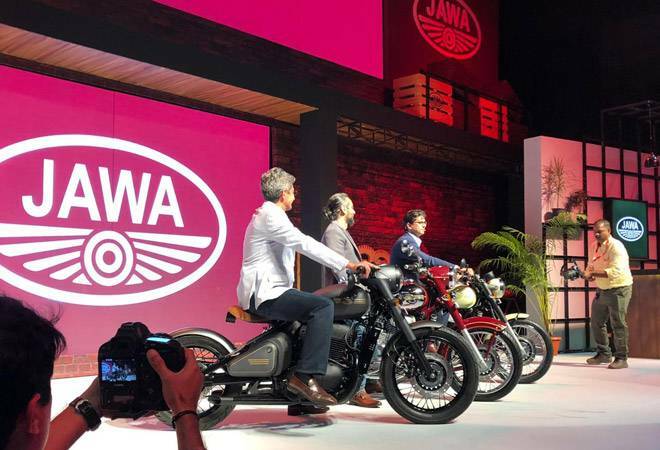 The variants launched today include Jawa, Jawa Forty Two, and a bobber custom, Jawa Perak, which have been priced between Rs 1.55 lakh to Rs 1.89 lakh. The legendary motorcycle brand Jawa has made a comeback with three new offerings to challenge Royal Enfield in the 300cc segment. The Mahindra-owned brand on Thursday launched three new variants with prices ranging from Rs 1.55 lakh to Rs 1.89 lakh. The variants launched today include Jawa, Jawa Forty Two, and a bobber custom, Jawa Perak. With the Jawa, the company is trying to recreate the charm of these motorcycles from the 70s era. The Jawa Forty Two, on the other hand, has been fashioned as a toned, muscled, sporty, aggressive version of the classic Jawa while having the lowest price tag among the three variants. The Jawa Perak, the costliest of the bunch, will be the first mass-produced bobber motorcycle by an Indian manufacturer. The Jawa and Jawa Forty Two variants are powered by a 293cc single-cylinder liquid-cooled DOHC engine, capable of producing 27bhp of max power and 28Nm of max torque. The powerhouse has been coupled with a constant mesh 6-speed transmission. The factory custom bobber Jawa Perak will be powered by a bigger 334cc single cylinder liquid-cooled engine, which can produce 30bhp of max power and 31Nm of max torque. The engine has been developed to conform to the BS VI emission norms. With a liquid-cooled engine, the company has kept the bikes future-proof while ensuring low torque. Jawa and Jawa Forty Two would be first models to go on sale, at Rs 1.64 lakh and Rs 1.55 lakh respectively (all prices ex-showroom Delhi). The motorcycles are already available for pre-order on the company's website. Bookings for Jawa Perak will begin at a later date, the company informed. A total of 105 dealers have been roped in across the country in cities which sell the most motorcycles, according to Jawa. The first 64 dealerships with test ride units will be functional from December this year. Deliveries are expected to begin sometime around February 2019. The Jawa will be available in three colour options, whereas the Jawa Forty Two will appear in six colour options. Upon arrival, the Jawa and Jawa Forty Two will be in direct competition with the Royal Enfield Classic 350 and Bullet 350, the unchallenged leaders of the 300cc segment in India right now. Other competitors will include the Bajaj Pulsar Dominar, KTM 390 Duke, TVS Apache RR310.